Harribobs’s Listener puzzle from last year was all about the eight post-war German chancellors. It required PALAIS SCHAUMBURG to be written under the grid. I checked lots of things in the puzzle before sending it off to St Albans. Unfortunately the spelling of SCHAUMBURG wasn’t one of them. Somewhere along the line it got changed to SCHAUMBERG. Grrr! I knew I was in for a reasonably tricky ride here, even though Harribobs is a relatively new setter with his first puzzle in 2015. Although I didn’t tackle it, Inquisitor 1526 Inner Turmoil caused a lot of debate over at 15², with clues under the headings Normal, Reversed, Cycled, Reversed and Cycled, Jumbled. Yikes. Nothing too unusual here this week. All entries needed to have one letter changed before entry and all across clues needed one letter changing before solving (I think that’s a misprint to you and me). 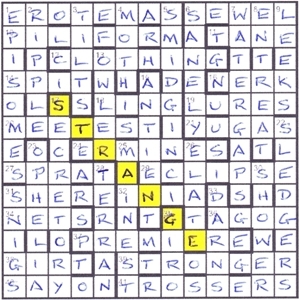 The new letters in the grid would spell out a quotation, and the new letters in the clues would give its source. Yikes! Starting on the downs seemed logical… nothing but straightforward clueing here. Although I know precious little about cricket, I managed 3dn WILTS (with help from Google), followed by 4dn Particle with periodic arrangement in aminobutene (4) for MOTE (since it was unlikely to be A NUN). For some bizarre reason (OK, those who know me it’s because I’m going gaga), I wrote TAP WATERS in at 7dn instead of WATER TAPS. As expected, progress was fairly slow — clashes frequently are, which is what they effectively were, and lots of them. Eventually the correct versions of misprints in the across clues gave Keramos, Henry W Longfellow. I thought the editors were having a pop at me by forcing me to reference both my mistakes from last year, although Sabre’s bees was actually based on a quotation from Longfellow’s Kavanagh. Keramos seemed to be a somewhat lengthy poem, but I didn’t need to read all of it, although I did. It seemed to be about a potter and his art, although it was probably a metaphor for life and death or some such — over to you, Shirley. Anyway, a short way in I came to “[Turn, turn, my wheel!] All things must change / To something new, to something strange;” and that hit the nail on the head. In fact, the quotation was needed to resolve some of the ambiguities since not all the changes to words resulted from clashes. For example 14ac SPOT could change to SPAT, SPET or SPIT. Before sending my solution off to JEG, I spent almost as long checking my solution as I had filling the grid (well, not quite). Even so, it is always possible that some gremlin got in the works. Let’s hope not. I’m pretty sure I highlighted STRANGE! All in all, a fairly tough day at the office. Thanks, Harribobs. This entry was posted on 13 April 2018 at 4:00 pm	and is filed under Solving Blogs. Tagged: An Exchange of Letters, Harribobs. You can follow any responses to this entry through the RSS 2.0 feed. You can leave a response, or trackback from your own site.